Samsung's newly found love for "premium build" is spilling down the ranks and if the new A-series get half the love and attention the S-line has been getting, it will be a job well done. The South Koreans are right to try and stir things up in the midrange to turn declining profits around. Flagships are to be admired from a distance, the average user would think, and spend their cash on gadgets that are simpler, safer and more affordable. Now, we're not sure we can call the Samsung Galaxy A5 "simple", and "affordable" is very much in question too, as the recently reviewed Galaxy A3 will testify. But slim, sharp and good-looking go without saying. Visually, the Samsung Galaxy A5 is even sleeker than the Galaxy A3, in no small part because its bigger size makes it look even slimmer and more cutting edge. Otherwise, both offer a white-painted metal frame, a razor thin profile, and a pearl-like finish of the back cover. 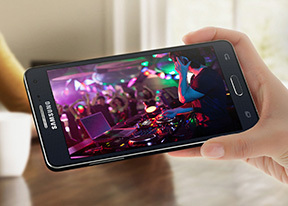 The Galaxy A5 however has a bigger, 5" Super AMOLED display and a beefier 13MP camera to show for its higher price tag. When Samsung launched the Galaxy Alpha we all thought they were proving a point - there, we can make handsome metal phones too. In hindsight, the Alpha is obviously more than just a preemptive strike against Apple's iPhone 6. Perhaps the beginning of Samsung's new strategy: make the same smartphones people love and buy, only make them look better on the outside. In light of the recent reports of dropping sales numbers, we can't really say whether the new design philosophy is working out for Samsung or not. But we do like the new gloss-free design and quality finish combining aluminum and steel. Samsung may have lost some of their grip on the market and looking at better-built products to get back where they were. But while everybody loves a good-looking phone, rivals like Motorola and Sony are offering cheaper midrangers with comparable features. Windows-powered smartphones are usually more affordable, not to mention the bargain-basement prices of the likes of Huawei and Xiaomi. Of course there are always users willing to pay a little extra for the better build and that's what Samsung's betting on. And it might as well pay off, as the Galaxy A5 is one of the most popular phones on this website. But the Samsung Galaxy A5 is more than just a precious toy. Hidden under the cold, precision-engineered exterior are quality internals. Imaging is dully covered by a 13MP camera, which made a solid impression just weeks ago at CES. Selfie fans will cheer the 5MP shooter on the front - that's more than the Samsung Galaxy Note 4 has on tap. The Snapdragon 410 chipset won't offer revolutionary performance, but it has the future-proofing of the 64-bit architecture and it's just waiting for app developers to catch up. The display is ample in size, with good resolution and Samsung's Super AMOLED technology known for superb contrast and vibrant colors. Finally, there's a 2,300mAh battery that should keep the A5 better covered than the Galaxy Alpha, which wouldn't win any battery endurance competitions. All of the aforementioned qualities add up to a very pleasing overall package. Sure, the Samsung Galaxy A5 commands a heavier price tag than the new 5" Moto G (2014) but adds what Samsung feels is more than enough flair to justify the asking price. Join us as we discover what the Galaxy A5 has to offer on the pages to come. very true it lags alot.